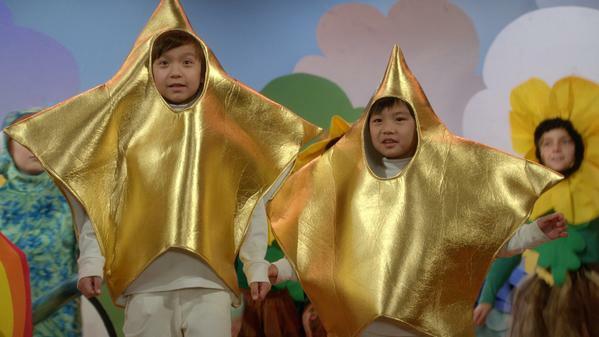 Today in our Fresh Off the Boat roundtable, we discuss episodes 11 and 12. “Very Superstitious” (11) deals with Jessica’s superstitions as she continues her real estate career, and the way Louis and Eddie tell white lies that build up to a visit from Child Services. 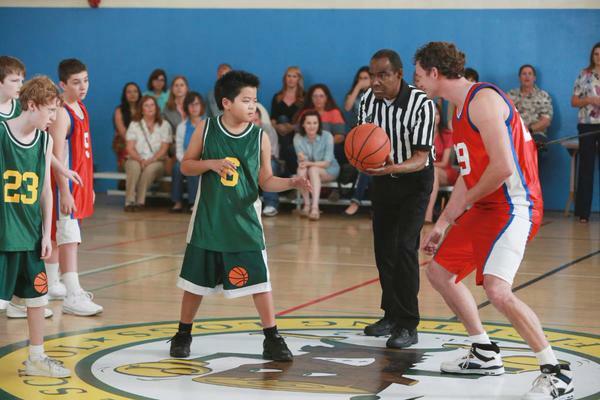 In “Dribbling Tiger, Bounce Pass Dragon,” (12) Louis steps up to coach Eddie’s basketball team and Jessica volunteers to direct the school play. Both parents balance their expectations of teamwork and work ethic with their childhood experiences (or lack thereof) with fun. K: So episode 11, “Very Superstitious,” revolves around Jessica’s superstitions — especially involving the number 4. More broadly, though, it arguably explores the importance of superstition within Asian and Asian-American culture as well. What did you guys think of this representation of superstition, which is sometimes seen as exaggerated, even farcical? Do you think the show’s depiction of superstition comes off as orientalist in some ways, by “othering” the superstitiousness within this Asian-American family? E: I think this episode highlighted one of the tensions I sense underlying the show’s writing in general: the enjoyment of Asian American audiences when they recognize specifically “Asian” things from their childhoods being represented on TV, versus the danger that representing these things will be exoticizing from a white audience’s point of view. A lot of Asian American audience members have taken to twitter and other platforms saying, “It’s so cool to see X or Y on TV, my childhood was definitely like that” regarding specific Asian things — like the Chinese Learning Center from an earlier episode, for example. But while that was a very real thing for lots of young Chinese-American kids, it also perpetuates the stereotype of Asian-American kids being the studious model minority. So it seems like a difficult balance between the two: pleasing the Asian American audience with what seems familiar, while trying to avoid exoticizing it for a white audience. But with regard to this particular episode, I feel like there was a slight difference between Jessica’s superstition and, say, Grandma’s — because Jessica was already presented as someone who loves Stephen King, that makes her superstition less of an “all Asians, old traditions” thing in my eyes, and more of an individual quirk. That’s maybe only visible to people watching closely, who have these Asian American tropes in mind, though. I feel like if you approach this episode thinking that Asian-Americans are superstitious already, it’d be easy to read the episode as confirming that…whereas it might actually do some work against that, but in a very subtle way. B: I agree that the danger of presenting these familiarities is exoticization from non-Asian cultures to an extent. The Huang family’s borderline irrational superstition in this episode, from Jessica to Louis (“Give me my jade!”) to the grandma lighting incense on the toilet, is a bit extreme and could be perceived as “othering” of this Asian-American family. Not to play devil’s advocate, but I know the writers are also attempting to make the show universal as best as they can. So overall, it’s about a family struggling to assimilate and fit in — that’s an experience everyone’s had in some way or another. This episode builds off of the characterization we’ve already seen with Jessica in past episodes — her love/fear of Stephen King and the nightly news, for example. So that is presented as more of an individual quirk, like you said Esther, versus the grandma’s very traditional form of superstitious practices. But I think there’s a part where they bring in white/American superstitions as well — when they’re at Cattleman’s Ranch, with tossing salt over one’s shoulder or something equivalent — that shows that these superstitions are not unique to just Asian culture. K: There’s definitely a double valence to this whole plot. I liked that the way they ended it, with the grandmother’s knowledge of rituals helping save the rest of the family from their apparent bad luck, which shows that the Huangs’ superstition is not entirely silly or unfounded. And as you pointed out, B, the bit with Nancy and the others in the restaurant also signified that superstition is not exclusive to Asian-American culture. What I didn’t like, however, was Louis telling Eddie that it was okay to lie “for the greater good” — i.e. to keep Jessica’s fears about bad luck infiltrating the household at bay. Obviously this was meant to be a humbling lesson for Louis in the end, but at the same time…the way this whole subplot played out just felt really odd to me. B: Going back to what we were discussing before (not related to just this episode but the show in general): it’s a delicate balance to present content that’s identifiable among the Asian-American community but to not consequently perpetuate certain stereotypes. But I think Eddie being the central character – even if he’s far from the real-life Eddie Huang – alleviates some of that model minority weight. Eddie is pretty much the opposite of a model minority (although his two brothers aren’t). I guess his parents constantly disapproving and pointing this out perpetuates that Tiger parents stereotype on their part, but I do think Eddie’s voice mitigates that somewhat. Now to Louis: I still think the writers are not completely sure of how to deal with his characterization. While he usually redeems himself from his faux pas, he again negatively influences Eddie and writes off Jessica’s fears. Are the creators playing up the somewhat incompetent archetypal sitcom dad with Louis? E: Yeah, I see that sitcom stereotype hovering in the background: the incompetent, less attractive dad and the hot hawkish mom. But I also never really know what to say about Louis’ storylines/character because I feel like it’s so clunky, and when he makes these missteps (like telling Eddie it’s ok to lie), the show never really addresses it fully — or the fallout is something that Eddie deals with, not Louis. B: At least Louis offered up an apology this time, and admitted that superstition is real if you believe in it, aligning with Jessica. That’s a step further than how he’s dealt with past incompetencies. Though what resulted from the web of lies led to something pretty serious: Child Protective Services paying a visit. This could have invoked something in the real-life Eddie Huang, who was abused as a child by his father. Eddie sent out a series of tweets denouncing the show, stating that it has strayed so far from his life that he doesn’t recognize it anymore. Eddie’s gone back and forth on this, on one hand saying that the show is a positive thing for Asian-American representation, but also claiming that it bastardizes his memoir. Could ABC have done more with this show (preserving more of the memoir’s authenticity and not making light of serious issues like child protective services) while keeping it palatable for network TV/a wide audience? K: That’s a good point, B. I’d forgotten about the child abuse storyline in the memoir that was left out of the show. In light of that fact, I feel like maybe the inclusion of the Child Protection Services agent was a really oblique, sitcom-friendly way for them to reference the child abuse? I don’t know how much they can include about that part of the real Eddie’s childhood beyond that, because while it may be bastardizing his memoir, the show is obviously catering to a general audience that probably isn’t ready to confront that kind of storyline in the context of a sitcom. B: Within the scope of a sitcom, I agree it’s challenging to feature grittier issues like child abuse. There are other parts of his memoir that can translate, though, that the show doesn’t yet capitalize on. For instance, the real-life Eddie’s made it a point to address how hip-hop was a form of catharsis for him, amid many of the struggles he encountered growing up. FOTB still fails to add that kind of complexity to the hip-hop narrative, and Eddie has yet to have a meaningful bond with a black character (any development with Walter kind of petered off). So maybe that’s something to look forward to in future episodes/if the show gets renewed. K: Now let’s move on to episode 12, “Dribbling Tiger, Bounce Pass Dragon.” I liked this episode a lot better than episode 11, if only because it confronted myths about Asianness in a much cheekier way. The most distinct example of this would be the Mystic Tiger League that Louis was a part of, and Eddie’s fantasies about Taiwanese-style basketball. As the title indicates, this refers to popular Chinese wuxia films like Crouching Tiger, Hidden Dragon, but I also interpreted it as an allusion to Shaolin Soccer (2001), another popular Chinese movie that had martial arts as a central trope. While Louis connects the basketball team (sans Dmitri) with “the band of misfits” — one of whom is a girl — in The Mighty Ducks, this group dynamic also describes the soccer team in Shaolin Soccer. And I think the reference is made more overt with Eddie’s fantasy about the wire-fu style basketball that his father must have played in Taiwan. Of course, the Shaolin Soccer reference could be seen as an anachronistic imposition, given that the show is set in the 90s, but regardless, I thought that attributing orientalist imaginings of the mystic, eastern, Taiwanese-style sports culture to Eddie’s point of view [since he is a second-generation Asian-American, after all] was a very clever move on the show’s part. B: Yeah, K, that’s an incredible reading. I do like the way the creators confront these myths about Asians head-on, especially when a lot of that is propagated by the media. Louis kind of dispels that with his actual coaching versus Eddie’s fantasy sequences. I love how you saw the tie-in with “Shaolin Soccer.” It’s been a while since I’ve seen it, but it’s such a fantastic film. Also in this episode: Jessica rewrites the nonsensical play Emery and Evan are in, titling it “Acting: A Cautionary Tale.” She thinks being in the play is pointless and asks her sons if they really think anyone is going to put two Chinese boys on TV. “Maybe if there’s a nerdy friend or a Chinatown.” This is pretty accurate commentary on the state of Asian representation in the media. However, it’s juxtapositioned in that it’s presented on a show about Asians with two Chinese boys, and this episode pays homage to “All-American Girl,” “Crouching Tiger, Hidden Dragon” and “Shaolin Soccer.” Was this the writers’ tongue-in-cheek way of commenting on how this situation is beginning to improve? E: I appreciated how tongue-in-cheek the references of this episode were, especially because Shaolin Soccer itself (and Crouching Tiger, to some extent), also function as meta-commentaries on their respective genres. In a similar way, Fresh off the Boat itself is an intervention in the genre of the sitcom. But I agree, Belinda, I think FotB has failed to address a lot of the issues open to them in their complexity (the role of hip hop in minority cultures of many kinds, as you mentioned, is one example), and I’m starting to turn away from our earlier excuses that this is ok because it’s an ABC show. Sure, the sitcom format is limiting, but I think it’s more open as a vehicle of critique than a lot of commentators have brought up. My hope is that by bringing up this lineage of other Asian faces in media (especially All-American Girl), the show is preparing for a more complex next season–one in which it can move beyond the issue of just “representation” (ie. mere presence) and delve more deeply into specific issues of the Asian American community and identity. But I’m also afraid referencing All-American Girl is a nod to the fact that Fresh Off the Boat might be similarly short-lived. So Jessica’s ironic commentary about Asian actors not making it can be read as a joke (since they’re obviously on TV), but it’s a joke that might still be too real, you know? Basically, the show might nod to improvement in the representation of Asian Americans in mass media, but I think it’s also very wary of it. It seems to be doing well, but as we pointed out when the show began, it might get crushed under the weight of being basically the only representation of Asian American families on TV. K: I agree that the show really dropped the ball when it comes to certain issues that it could have addressed more substantially, but didn’t. That being said, I’m glad both of you brought up All-American Girl, because the dramatic irony of that particular scene (“See? There are Asians on TV!”) highlighted for me the burden that the show faces because it’s the only one of its kind (that is, a contemporary show about an Asian-American family). Before the show premiered, Wall Street Journal writer Jeff Yang wrote a really moving piece about his complex relationship to both All-American Girl and Fresh off the Boat, since as a TV critic he contributed to the cancellation of the former, and as Hudson Yang’s father and as an Asian-American journalist, he is very much invested in the success of the latter. The fact that it took so long for an Asian-American family to return to TV really showcases how much scrutiny FOTB faces by virtue of its singularity, but I think that also highlights how we can’t hold the show as solely accountable for its representations of, well, anything — though that’s not to say it shouldn’t be immune to criticism, either. So I agree with you, E, that the joke of “There ARE Asians on TV” might hit very close to home for the cast and crew. Especially since the ratings have been dropping steadily since the pilot, and we still don’t know if it’s gonna be renewed next season. The timing of this episode’s airing also coincided with me watching Margaret Cho’s concert film, I’m the One that I Want, for my feminist theory class. Cho talked extensively about the failure of the show in I’m the One — how her face and body were deemed inappropriate for American TV, how she was pressured into losing 30 pounds in a very short period of time, how an “Asian consultant” was hired for her, how eventually all the Asians other than her and one other actress were fired. Her descriptions of how much the show/her protagonist within it was sanitized for an American audience, and how much her body was policed during the show’s production, were particularly resonant with Eddie Huang’s criticisms of FOTB. But I think both versions of the “sanitized” Asian-American family speak to how much work is still to be done before Asian-Americans on TV can be represented adequately without much concession to a general, perhaps oblivious, American audience. B: I’m sure many critics and viewers identify with Jeff Yang’s assessment of the two shows, even though they didn’t contribute to All-American Girl’s cancellation or have special interest in FOTB. From what I understand, All-American Girl wasn’t very well-received when it premiered, especially among the Korean-American community (which should’ve been its target audience) because Margaret Cho’s voice was so suppressed. I talked to Diane Mizota, an Asian-American actress, who actually interned on the show at the time. She said the writer’s room was really homogenous, with its makeup of mostly white men, and a “Korean correspondent,” who would come in every now and then and basically say, “Yeah, you bring fruit to someone’s house when you visit.” FOB’s showrunner is a POC and wanted to avoid that this time around, so the show is better staffed and inherently more likely to thrive that way. And another difference is that now, people welcome and champion diversity. E: At least, I hope that people welcome and champion diversity. Though I also think that with the perceived success of minorities in media and other areas, there will be a stronger backlash against their/our presence, as you pointed out in your earlier piece, B. B: True. I guess we’ll have to see how the show’s ending pans out, too. FOTB — while scrutinized because of its singularity (even with our roundtable analyses) — also receives so much support from the Asian-American community; we may not think the show is perfect, but we are tuning in and tweeting about it and sharing it on social media regardless, and I think that’s important.